At the beginning of 1942, America and its British ally were the underdogs fighting a two-front world war. After losing Singapore (and Tobruk in North Africa), Winston Churchill described 1942 as one of the darkest years in British history. Jimmy Doolittle of air racing fame was among the few people in America with the vision, leadership, and flying skills to pull off an early counter strike on Japan. Risking a portion of the US aircraft carrier force that was outnumbered 2 to 1, Doolittle planned, trained the crews, and led an attack using US Army medium bombers launched from the deck of the USS Hornet I (CV-8) to target Tokyo, Japan. Leaving Alameda Air Station on April 1, 1942, the Hornet with 16 B-25s lashed to the deck and escorted by the USS Enterprise (CV-6) and a dozen cruisers and destroyers headed towards Tokyo. A day before the launch date, the American task force was discovered by a Japanese picket boat. Before US cruisers could open fire, the boat sent a brief message. 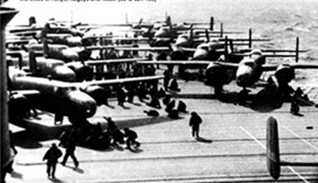 The choices were to push the B-25s overboard and head for home, or launch hundreds of miles early with insufficient fuel to fly to the Chinese base at Chuchow. For Doolittle and his men, the decision was easy! Turning the Hornet into the wind at flank speed, Doolittle’s first B-25 was airborne using only half the flight deck. 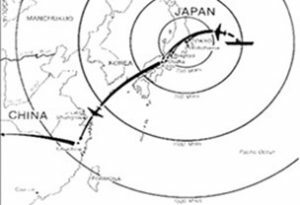 Flying just above the waves for hours, they achieved complete surprise and dropped small bomb loads over Tokyo and Yokohama before heading for the coast of China. After about a dozen hours of flying and near fuel exhaustion the pilots decided to bail out or ditch their B-25s along the coast of China. The Japanese occupation forces inflicted a horrific price on tens of thousands of the Chinese people who helped guide the remaining American 5-man crews to safety. The Japanese also executed 3 men and imprisoned the remaining two captured crews. Another B-25 diverted and landed in Soviet territory after experiencing engine problems. The crew was somewhat comfortably interred through the war, and Doolittle often laughed at the invoice the Soviets sent each month for rent! 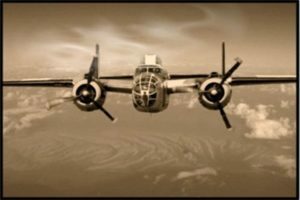 The bombs dropped by the 16 North American B-25s on April 18, 1942, amounted to little more than a tactical slap at the Japanese. However, like a boxer setting up the next few punches, the Doolittle raid angered the Japanese Navy into a hasty strategy in the South Pacific. Using information from breaking the Japanese code, a few months later in June of 1942, three outnumbered American aircraft carriers (Enterprise, Hornet, and Yorktown) then ambushed the Japanese fleet near Midway Island. Four of the six Japanese aircraft carriers that launched planes against Pearl Harbor were sunk. The US Navy lost the USS Yorktown during the Battle of Midway and in October of 1942, the USS Hornet was sunk off the Santa Cruz Islands. 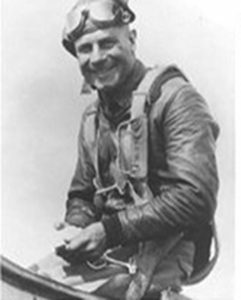 However, thanks to General Jimmy Doolittle, the turning point of WWII in the Pacific occurred just seven months after the devastation of the US Navy at Pearl Harbor.